Love is in the air at Young Scholars Academy! Nothing says “love” better than a homemade gift or treat from your child on Valentine’s Day! 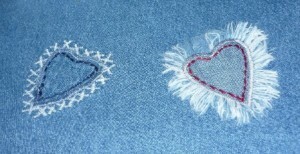 • Yarn Heart Cards: Give your kiddos child-safe plastic needles to stitch up some yarn heart cards. All you need is some colored card stock, scissors, tape colored yarn and the child-safe plastic needles. Fold the card stock in half, draw a heart and cut it out then tape it to the front of the card stock. Lay the card flat and with the heart as your template punch holes in the card stock with the needle and then discard the heart template. Have your child thread the needle with the yarn and knot the end. Start inside the card and stitch from side to side and finish by knotting on the inside of the card and trim the excess yarn. • Paper Blooms are another simple and fun project to make with your kids. Again you’ll need colored cardstock and also wooden spools, heart craft punches, straight pins, craft glue, cloth-covered floral wire, small buttons and grosgrain ribbon the same width as the spools you are using. Punch out a circle from cardstock and poke a small hole in the center with a straight pin. Child: Punch out five heart shapes and fold in half lengthwise for petals. Glue the petals around the circle, leaving the hole unobscured; set aside to dry. Thread one end of a length of floral wire through two holes on a button and twist to secure. Push the opposite end of the wire through the hole in the middle of the flower shape for a stem. Repeat to make more flowers. To make the “vase” – Wrap a length of ribbon around the spool and glue to secure. Trim the flower stems and stick them into the spool to display. • Want an easy and yummy Valentine’s snack? Make ice cubes from pomegranate juice and float them in a fruit smoothie! You can teach your child that love is in the air with these easy Valentine’s Day gifts they can make with you.